Since 2004, (Fleet Foxes) J. Tillman has quietly been releasing records, some of limited quantity, some mostly available in Europe, but for the most part, unheard. The borderline-alienating starkness and well lived-in narratives of his first two records, “I Will Return” and “Long May You Run, J. Tillman” (released in limited runs of 150) endeared him to fans of Nick Drake, Will Oldham and fellow Seattle resident Damien Jurado; one of the first to hear his recordings, and who would, early on, take him on his first US tour. 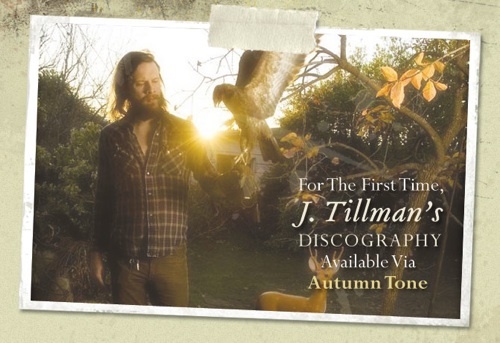 In 2006, after three months in Europe touring on his third album, “Minor Works”, Tillman recorded his fourth collection of songs at home with his brother and roommate. “Cancer and Delirium” strikes a perfect balance between the intimacy of his earlier releases with the nuanced, melodic sense of “Minor Works.” Each song is imbued with the same strikingly disconsolate singing and devastatingly poignant prose that Tillman is known for and accented with some of his most gorgeous, spare arrangements. Aquarium Drunkard’s Autumn Tone Records is proud to make these albums available digitally for the first time. Any idea when Long May You Run and Cancer & Delirium will be available on eMusic? Thanks AD! I picked up the “First Born” bonus track that you had up on iTunes. Thanks soo much, any new Tillman is always appreciated! Pingback: Music News, IOmusic.net » mp3 premiere: new J. Tillman | "earthly bodies"
Pingback: besidethebend.com » Blog Archive » mp3 premiere: new J. Tillman | "earthly bodies"